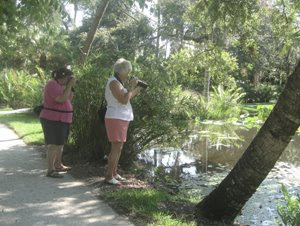 Last Saturday, a few of the ladies from the Art and Antique Studio Gallery went to the McKee Gardens in Vero Beach, Florida. 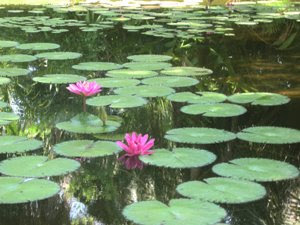 The folks at McKee were holding a Water Lily Festival in their beautiful gardens and ponds. I was part of the gallery group and spent nearly two hours (not enough time!!!) taking photos. I saw more colors of water lilies than I ever knew existed. Besides the record heat (high 90's), the day was absolutely beautiful and the light was perfect for the photographers who enjoyed the sights. Above left are Therese and Barbara shooting a few scenes from a shady spot near the main pond. Here is just one of the 160 photos I took that morning. I am sure there will be a few new paintings of water lilies this year!